Iceland is an amazing country, with so many things to see and do. Chances are, you’ll be basing yourself in Reykjavik, the country’s capital and only official city. But don’t rush off; spend a day in Reykjavik! If you’re like us, you’re planning on spending your time in Iceland exploring waterfalls, beaches, and beautiful landscapes. This may leave you with limited time to explore Reykjavik. However, we still think that you should give yourself a day to get to know the city and its historic and cultural landmarks. Luckily, the city isn’t very large, so most of Reykjavik’s must-sees can be seen in one day. Below are what we believe to be the top places to visit in Reykjavik. Reykjavik’s most iconic structure is, without a doubt, Hallgrímskirkja Church. If you only have 24 hours in Reykjavik, make sure you visit this building first. It towers above the city, flaunting it’s impressive architecture that was inspired by basalt rocks found throughout Iceland. Standing guard in front of the church is Leifur Eiriksson, considered the first European to have discovered North America (500 years before Christopher Columbus). We arrived just as the church was opening; the sun wasn’t even completely out yet! Inside, the church was impressive in its simpleness, if that makes sense. The 15 meter tall organ was also pretty impressive. Next we got in line to head up to the top of the tower. It costs 900 ISK (about $8) for a ticket and you get some really great views of the city. Hallgrímskirkja Church can be seen from almost anywhere in the city, so make sure to look for it at night as well. It looks even more majestic when it’s lit up! Directly in front of Hallgrímskirkja Church is Skólavörðustígur Street, one of the two main streets in Reykjavik. Take your time as you stroll by shops, cafes, and restaurants. During your day in Reykjavik, you’ll most likely go up and down this street a few times. Reykjavik’s City Hall is pretty large and visitors can visit the modern structure during weekdays. There are often exhibits held inside, but the outside of the building is what drew us to the area. The large pond has a path that surrounds it and a lot of different birds hang out there, including swans. This was a really cool museum! In 2001, the remains of a Viking longhouse from the 10th century were discovered, so this museum was built around it. You can see the wall fragments that are really well preserved, as well as other artifacts that were unearthed. You can even see walrus bones that were found at the base of the western wall (placed there most likely to ward off evil). There’s also a lot of multimedia technology that you can control by pressing buttons or just waving your hands; this technology is used to help explain more about the site and what life was like during the 10th century. It costs 1,600 ISK (about $14) to enter. Another impressive church! Located on the western side of Reykjavik, this church is often referred to as Kristskirkja (Christ’s Church). Although it’s not as famous as Hallgrímskirkja, we thought the inside of Landakotskirkja was a bit prettier. With a design that was also inspired by basalt rocks, the Harpa Concert and Conference Center has won both architectural and musical awards. The center has held many concerts, festivals, and conferences since it opened in 2011 but you can also just walk inside to enjoy the design of the building itself. The multi-colored glass is awesome to see from the inside, especially when the sun is shining through. Make sure you walk up the different levels to see the glass from different angles. It’s definitely a must see during your day in Reykjavik. Just down the street from Harpa is the Solfar Sun Voyager Sculpture. Created by Jon Gunnar Arnason, this steel structure may look like a Viking ship, but it is actually an ode to the sun. It was created to resemble a dreamboat, symbolizing light and hope. If you have time, we really suggest heading out to the Grótta Lighthouse. It’s just outside the city and totally worth the trip. If you’d like more information on the Grótta Lighthouse, check out our post which goes over different ways of getting there and the kinds of things you’ll see in the area. We visited the lighthouse in the middle of the day, between our stops at Landakotskirkja and Harpa. We also heard great things about the National Museum of Iceland and The Pearl, but they were further south and we weren’t able to squeeze them in. If you were to spend a second day exploring Reykjavik, we would recommend visiting these two places as well. – Reykjavik is only slightly hilly in some areas, but still be sure to wear comfortable shoes. – While walking around the city, look around for Reykjavik’s cool street art. – Be prepared for all kinds of weather. We’re not kidding when we say it can be raining, sunny, then snowing all within 10 minutes. – Most stores, restaurants, and even taxis accept credit cards. The only time you will need cash is for some hot dog stands or if you take a bus. – If you’re on a really strict budget, we recommend taking some snacks with you that you can munch on while you explore the city. – Opening hours for museums/restaurants will vary depending on the season. – Almost everywhere you stop in will have free WiFi, but to help you find your way while walking from place to place, download the map of Reykjavik on Google Maps. That way you can still navigate while being offline. If you need help with it or have questions, we found this link very helpful. – If you have any questions about anything, just ask! Everyone is super friendly and willing to help. It seems most people only spend a day in the capital before heading off on their road trips around the country, but as you’ve laid out here there’s definitely plenty to see and it’s a great base! 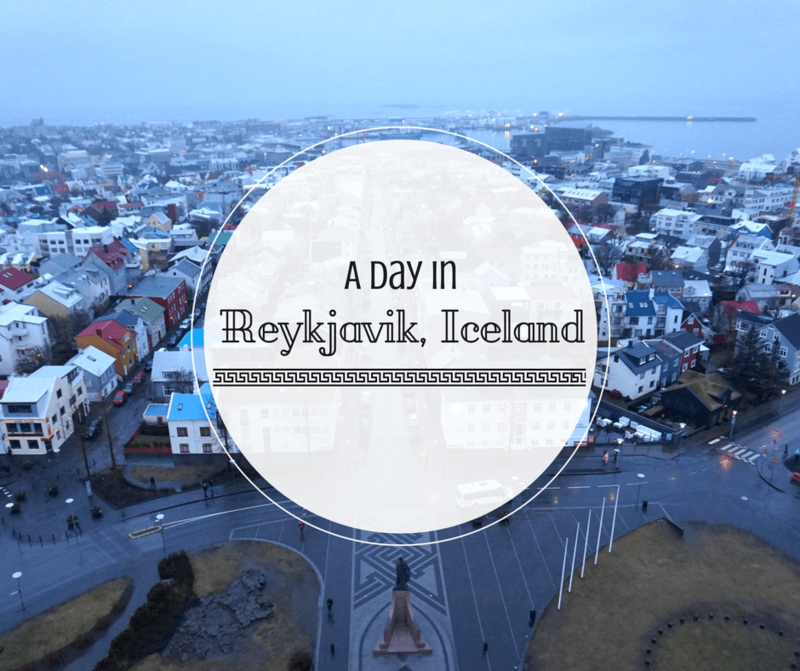 I like Reykjavík because it’s compact and has everything you need to start a memorable trip in Iceland. Spending one day at a leisurely pace is the best thing to do as there are quite a few interesting things to see and do. I really like the views from Hallgrímskirkja and Lake Tjörnin. I love beautiful architecture and that concert hall is simply stunning, I would go there to just visit this amazing structure, oh yes and to see some wonderful landscape along the way. I love the architecture of Hallgrímskirkja Church – Amazing, but actually most suprising is that I haven’t seen it before! The simple yet impressive architecture of HALLGRÍMSKIRKJA Church is stunning! I would love to visit Iceland unfortunately my husband is not very keen on visiting. Reykjavik looks like an awesome place to base yourself while exploring Iceland. Next time we head to Europe we are planning to stop in Iceland for a week or 2 to explore. I had no idea that Reykjavik had such great architecture, we will definitely leave time to explore this city when we get there. You’re going to spend a good amount of time there, so you’ll get to explore a lot. Right now I am feeling like cancelling my planned trip to Cambodia and get to Iceland! 😛 Such a lot of places to see. The church architecture is indeed amazing! Love the architecture. There’s a lot to see in Iceland, hope the weather doesn’t hinder one from moving around. Hi David! Within the city itself, the weather really isn’t an issue; the streets are very well maintained. Sometimes weather is an issue in the more rural areas though. I’ve not yet visited Iceland, but your post and many others I have read about this great country have made me add Reykjavik and area to my wish list. You shared very useful and great information in this blog. I really like it. Thanks for sharing it. Thanks for this blog, I will plan out my trip as per your blog.